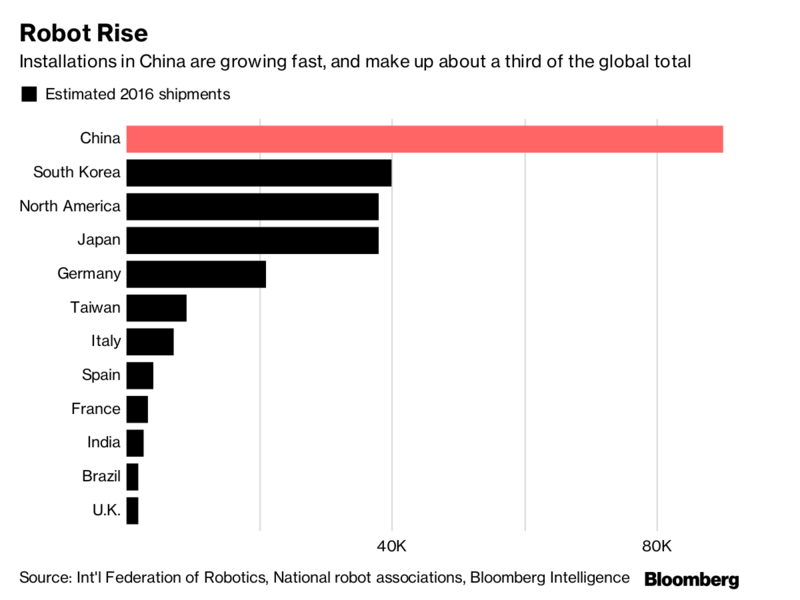 Shipments jumped 27 percent to about 90,000 units last year, a single-country record and almost a third of the global total, and will nearly double to 160,000 in 2019, the International Federation of Robotics estimates. The blazing pace hasn’t dented Chinese wages – yet – but it might influence the global economy, according to a report this week by Bloomberg Intelligence. 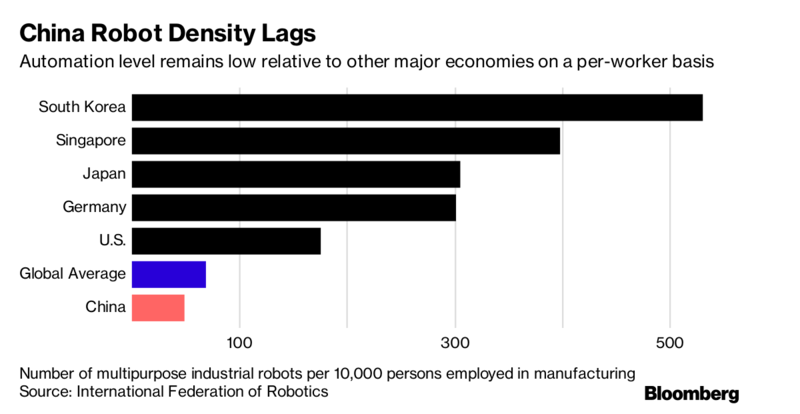 Automation may drive productivity gains and export competitiveness, but the rising use of robots also threatens to exacerbate domestic income inequality, undermining consumption. And that could spill out beyond the country’s borders, economists said. Robots are at the core of the government’s sweeping Made in China 2025 plan to upgrade factories to be highly automated and technologically-advanced. Replacing assembly-line workers will also help it to offset a shrinking working-age population. 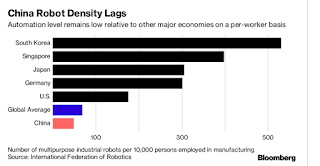 And while China is catching up to global leaders like South Korea and Singapore, saturation is nowhere in sight and its density of robots is below the world average, according to the IFR. China also is buying more and more of its own robots. Under Made in China 2025 and a five-year robot plan launched last year, Beijing plans to focus on automating key sectors like car manufacturing, electronics, appliances, logistics, and food. The “robot revolution” proposed by President Xi Jinping in 2014 will also raise fears of greater inequality as the benefits of productivity gains are skewed toward the owners of capital, at the expense of workers, according to BI. Such an outcome would be bad news for household spending and might delay the shift toward a consumer-driven economy, Orlik and Chen said. The government also wants to increase the share of Chinese-branded robots in the country’s $11 billion market to more than 50 percent of total sales volume by 2020 from 31 percent last year, and aims to produce 100,000 robots a year by 2020, compared with 33,000 in 2015. 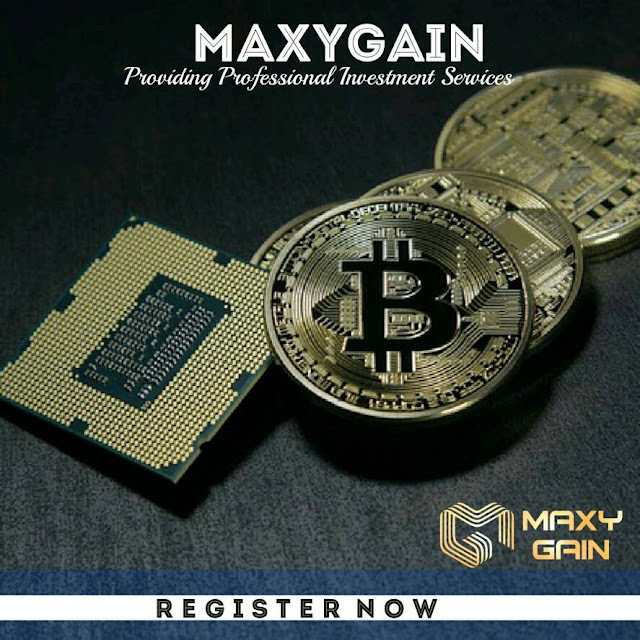 That means competition will intensify for foreign firms that supply 67 percent of China’s robots, such as Japan’s Fanuc Corp. and Yaskawa Electric Corp., according to BI.